Kevin has just finished the first scabbard for the Brescia Spadona. Holiday Season Greetings from Albion! We hope that all of our customers and friends enjoy a fruitful and happy Holiday Season and extend our best wishes for a wonderful 2006! 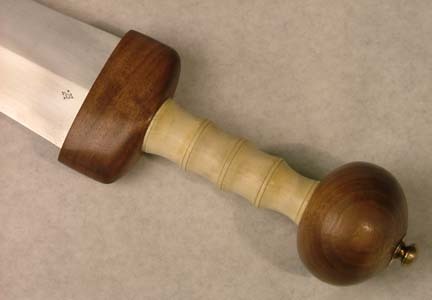 Albion has been granted the endorsement of the Robert A. and Virginia Heinlein Prize Trust for our limited edition recreation project -- now Lady Vivamus is the official recreation of the sword described in Heinlein's classic, Glory Road! The Heinlein Prize Trust promotes and awards the Heinlein Prize for advances in commercial space activities. Robert Heinlein, all text from Glory Road and Lady Vivamus ©2005 The Heinlein Prize Trust, used with permission. The winners have been announced in the Name That Sword Contest III. Go here for more information. We are experimenting with offering a secure shopping cart -- right now it is set up as a parallel site. If you like to order on-line, please give it a try and let us know what you think! Peter Johnsson is here on his historic 10th visit to Albion. On this trip, he is concentrating on R&D for the next sword models to be released and on the swords nearing final development. Peter has been making great strides on the Knecht and Meister during his stay. Here are a few photos. Pictured here are the Knecht and Meister with test grips fitted and with the Meister pommel wax nearing completion. 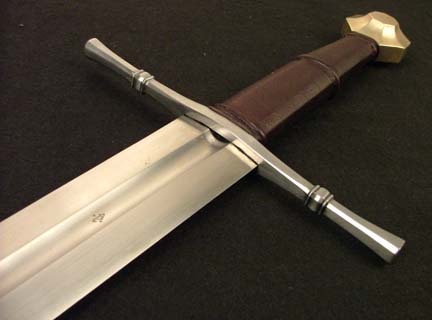 Peter has finished the final waxes for the St. Maurice and a test grind on the blade. The blade is about 80% finished in these photos and the hilt waxes are clayed for molding. Peter has finished the first prototype for a Maestro line blade, etablishing proper weights, edge thickness and balance for this new line of practice swords. Now he will move on to final design consultation with Steve Fisher, our CAD designer. Pictured below are several views of the unfinished prototype. 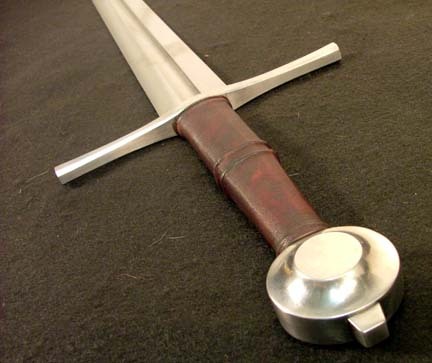 We have added a lot of blades and parts left from Del Tins and FirstGen swords, as well as prototype and discontinued helms that will be going up on our Moat page over the next couple of weeks. Drastic savings on some do-it-yourself parts! 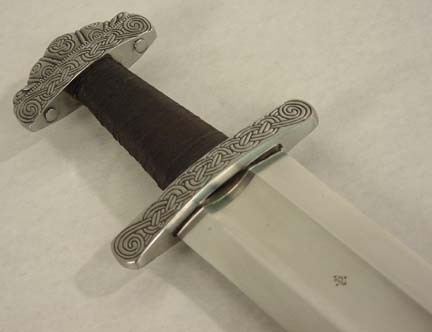 Less than 10 Vinland Viking Swords remain in the limited edition. Grab one now before they disappear! We have a lot of blades and parts left from Del Tins and FirstGen swords that will be going up on our Moat page over the next couple of weeks. Drastic savings on some do-it-yourself parts! 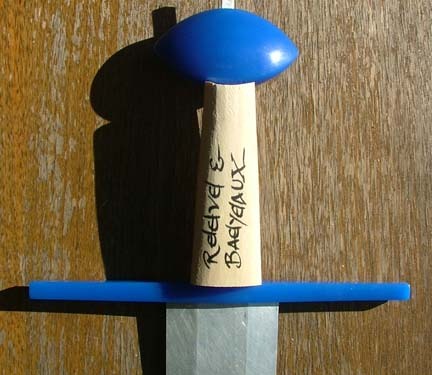 A new protoype has been completed for the Sword of Saint Maurice blade. This heat treated blank will be sent to Peter in Sweden for testing and final hilt modelling. In the detail photos, you can see the engraving on each side of the blade. Our friend James Williams, president of Bugei Trading Co. and an accomplished martial artist and instructor, recently filmed a cutting session with the Knight..
Go here for to download and watch the videos! 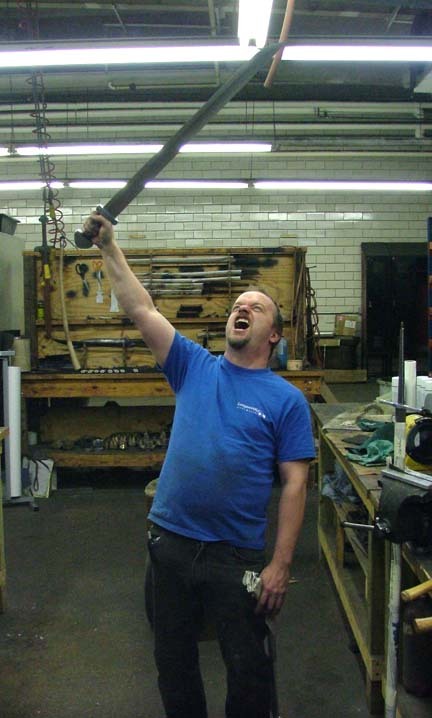 Albion has donated one of the 10 Limited Edition Conan Masters (Father's) Swords to an auction benefitting the American Red Cross Hurricane Relief Effort hosted by Charityfolks.com and Toy Shop Magazine called "Collectibles for the American Red Cross." Details of the auction can be found here. Bid now on this valuable collectable! It is a great way to help those who help others! Vocation Vacations has chosen Albion as a Dream Job Holiday. 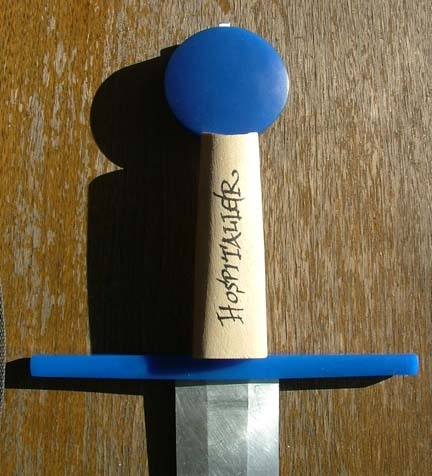 If you have ever wanted to see if you like making swords, here's a fun way to give it a try! Go here for more information..
We've been seeing more and more couples buying swords for their weddings and women buying them as engagement gifts for their man. Albion is considering creating a marketing event around this. We'd like to make it a sincere campaign, and therefore would like to use actual photographs of couples getting engaged and married. Read more about how to enter the contest here! 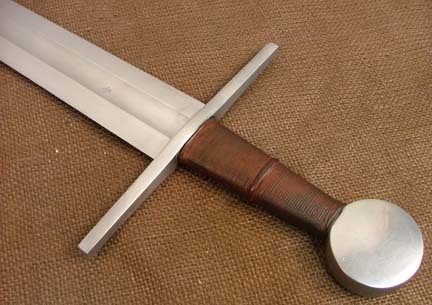 New hands-on review of the Museum Line Solingen sword at myArmoury -- read all about it here. Eric McHugh has just finished a sweet custom Grossemesser. Go here for more photos. John Gage has finished the scabbard for his Hell Bowie. These will now go on to molding! Next Generation Anniversary Sale Extended! Two years ago today we announced the first of the Next Generation sword line... To continue celebrating, we are extending the NextGen sale for another month -- $100 off all NextGen swords (even those not in production yet) until September 20th, 2005. Mike Sigman is turning his hand to making knives -- see more photos of his first project here. Search Engione Strategies 2005 Conference and Expo in San Jose, California. The session was entitled Pimp My Site (based on MTV's popular show Pimp My Ride). The session will continue with a report on progress at the Chicago conference in December 2005. We'd like to thank Jennifer Laycock, Todd Friesen, Dax Herrera, Heather Lloyd-Martin, and Elisabeth Osmeloski for their expert assistance and we look forward to the changes that the next few months will bring! Read more about it on C/Net. We have a winner at last! Go here for more details. It is hard to believe that it has only been two years since the introduction of the Next Generation Line -- so much has happened and so many models have been introduced. 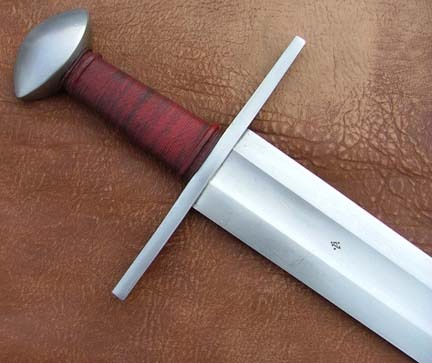 Peter Johnsson and the staff at Albion have done a remarkable job in bringing these swords to life -- successfully combining authenticity, full functionality and custom-level quality at production prices. 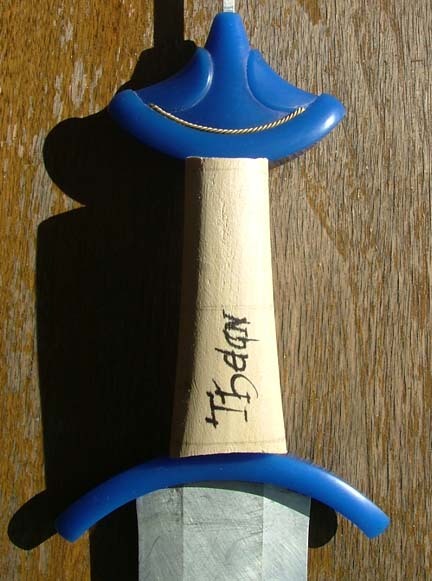 On August 17th, 2003, we introduced the first 4 swords in the line -- The Vinland, The Clontarf, The Gotland and The Gaddhjalt. These swords were in production by November, 2003, when we then announced the first of many "next waves" of NextGen swords. In just two short years, the line of NextGen swords has grown to 28 models in production (that's an average of more than 1 new sword model a month! ), with another 32 models (plus a few still "secret" ones) in development. See details on these sword models on our Next Generation Swords page. In Wisconsin, a show produced by Wisconsin Public Television, visited our facility last week for a show airing this Fall. Part of the filming involved a live destructive test of our blades. 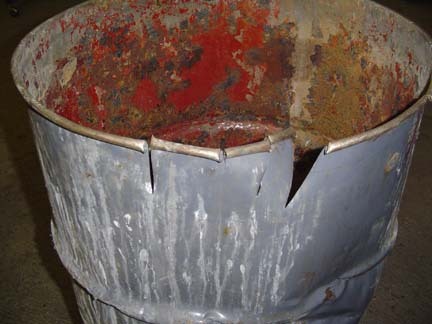 Jason pulled a Duke blade from the rack and attacked a steel barrel with no damage to the blade -- you can see the results in the photo below. 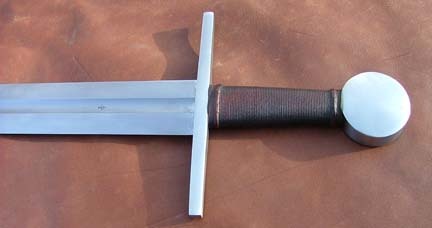 There is also an excellent MyArmoury.com Spotlight Article on the Oakeshott Type XI swords here. 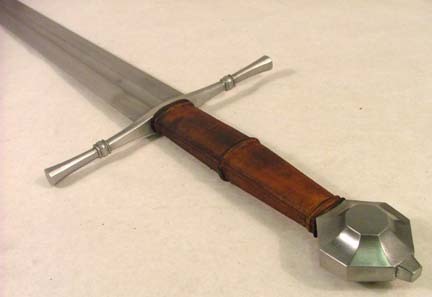 All pending Del Tin orders through Albion will be filled as soon as the swords are available from Del Tin. We are now producing a version of the Count XIIIa in steel as well as bronze pommel. Go here for more photos. 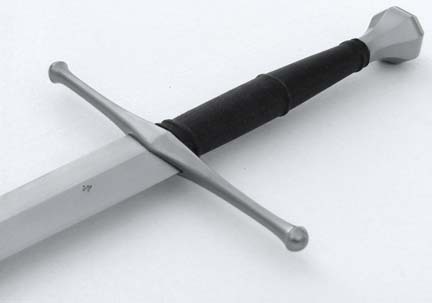 Unfortunately, as of Monday, June 13th, we are forced to raise our standard domestic shipping and handling price for swords to $30. We have been able to hold our price of $25 for over 2 years, but recent increases in shipping costs and the cost of our boxes and inserts, require us to make this increase. For pending orders placed before June 13th, we will honor the $25 shipping price. This is the NextGen inspired by the Bayerisches Nationalmuseum Sword (which is the next Museum Line model after Turin is complete.) Peter knows the original sword intimately, and it is our goal to bring you a less "gilded" version with the same performance and handling as the original. The Atlanta Blade Show was a huge success -- we met many new and old friends there -- we will be back next year! Your Chance To Steal a Svante! 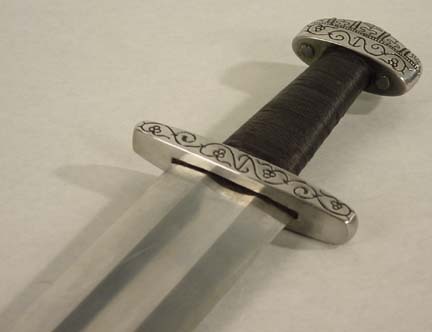 Albion donated a Svante Nilsson Sture Sword to the Wisconsin Public Television Auction -- the auction closes this Sunday, June 5th. Here is a chance to get a bargain and support public television! Update: The auction was a great success -- the lucky bidder was one of our current customers! Brett Stark has just finished a very nice new scramseax. Go here for more photos. 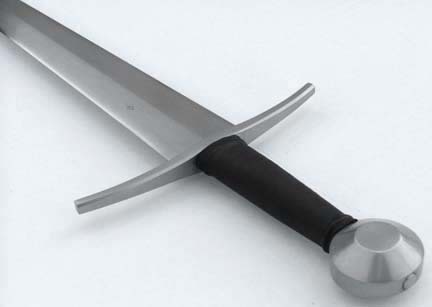 MyArmoury has published a new review of an Albion sword -- the Next Generation Hersir. We've added some items to the Moat Sale page. We've changed our front page! Let us know what you think -- is it an improvement or are there features that you miss? 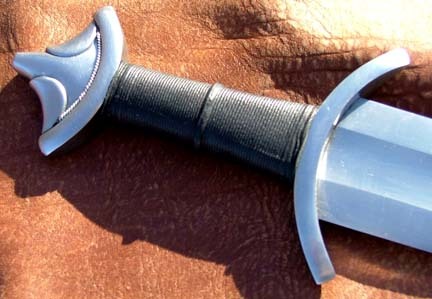 MyArmoury has published a new review of an Albion sword -- the Next Generation Laird. 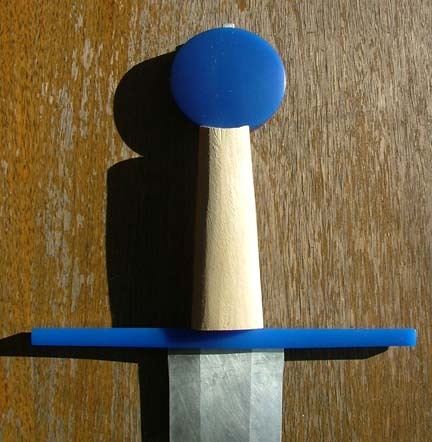 MyArmoury has published a new review of an Albion sword -- the Next Generation Castellan. We will finally have a print catalog! If you are already an Albion customer, a copy will be sent to you. If you are not already a customer, go here to order your free copy! The catalog is free for all Domestic US addresses. Due to the high shipping costs, we are forced to charge $5 USD for Canadian catalog requests and $10 for European catalog requests. Please contact Mike at Albion Customer Service to place an order for a catalog. Reserve yours before the limited edition is gone! 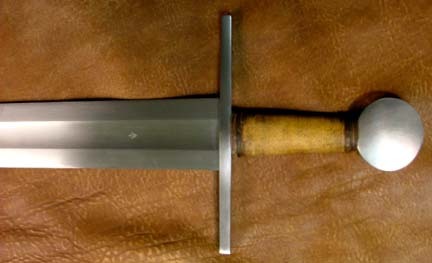 John Gage has just finished his latest creation, Hell Bowie. Go here for more photos. MyArmoury has published two new reviews of Albion swords -- the Next Generation Knight and the Squire Line Great Sword. Steve Fisher has just finished the programming for the Kingmaker. Here are photos of the rough blade blank. Albion is proud to announce the results of Peter Johnsson's intensive decades-long research project. 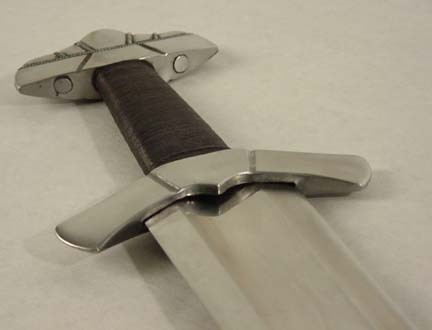 Building on the work of illustrious predecessors such as Ewart Oakeshott (Typology of the Medieval Sword) and Jan Petersen (Typology of the Viking Sword), Peter has developed a new, never-before-attempted, ground-breaking, really brand-new Sword Typology. Go here to see details on this exciting announcement! John Gage and Kevin Iseli just completed a gorgeous custom dirk. Click on the photo to see more. 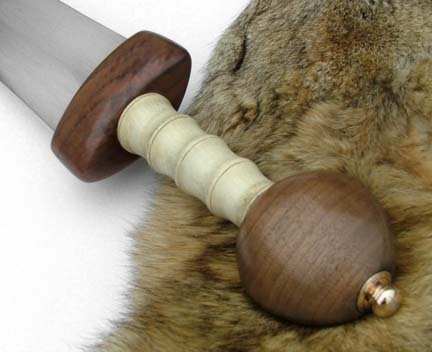 Kevin just completed a beautiful scabbard for the Laird/Caithness swords. Click on the photo to see more. These first three models are scheduled for release in the Fall 2005. See more upcoming models here. Steve Fisher has just finished the programming for the Meister (Grossemesser) and Knecht (Kriegsmesser), Here are photos of the rough blade blanks. Amy Waddell, President and CEO of Albion, presents New Glarus Police Chief Steve Allbaugh with a handmade one-of-a-kind Medieval Jambaya Dagger by Jody Samson, as a thank you from the Albion staff for the Chief's service to our country. We're glad to have him back! We are having special contest -- help us develop a new marketing message and win the Albion Mark Next Generation Sword of your choice! Go here for contest details. Albion now offers a maintenance plan for Albion Mark swords to keep your sword in "like new" condition. The first Count has been completed. See more photos here. We have winners in the Name That Sword Contest II! 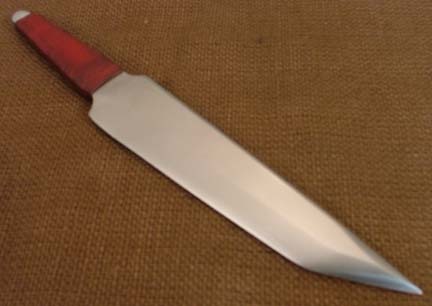 Steve Fisher has just finished the programming for the Vassal Falchion, Here is a photo of the rough blade blank. Only one First Generation Crecy remains... See the FirstGen page for details. Only a few of the FirstGen blades remain and we are on the countdown now from less than 10 each of these models. See the FirstGen page for details. 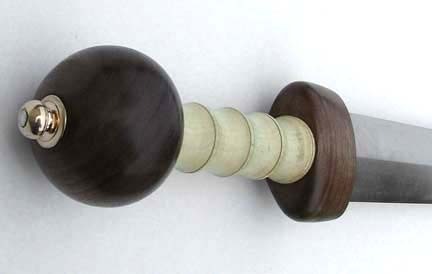 These will now go to Peter for final development of the hilt waxes. 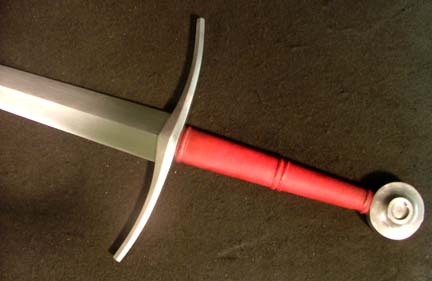 Lars just finished the prototype Sabre. Go here for more photos. Kevin just completed a beautiful scabbard for the Sovereign. Click on the photo to see more. We are having another Name That Sword Contest! Introducing 24 new models in development for the new year! Our friend Drew has opened a new website offering Wisconsin-made pewter and stone castings on both historical and fantasy themes. Check out his offerings at http://dashpromotions.com.